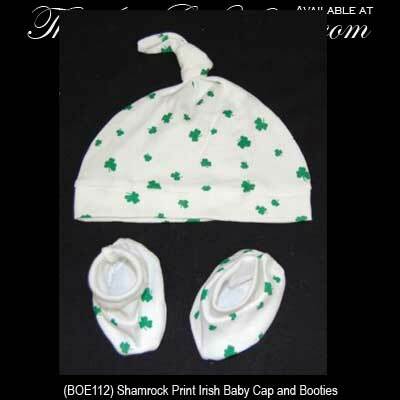 This Irish baby gift set features a cap and booties that are enhanced with shamrocks. This Irish baby hat and booties set features an all over printed shamrock design on 100% white cotton. The shamrock cap and booties are made of 100% cotton. The Irish baby cap and booties are gift boxed with a shamrock history card that is complements of The Irish Gift House. Baby will look so cute in this Irish onesie that features an all over shamrock print design.